Built by Maharaja Jai Singh Prabhakar in 1918 AD, Vijay Mandir Palace is a beautiful palace located about 10km from Alwar City. What adds to the beauty even more is the serene lake in the foreground and the magnificent garden surrounding the palace. This sprawling place constitutes 105 rooms. It is said that previously the king had ordered to build a palace and not happy with that palace he ordered to build the Vijay Mandir Palace. Tha palace also have a huge garden which is filled with beautiful flowers and trees, which adds to the beauty of the palace. 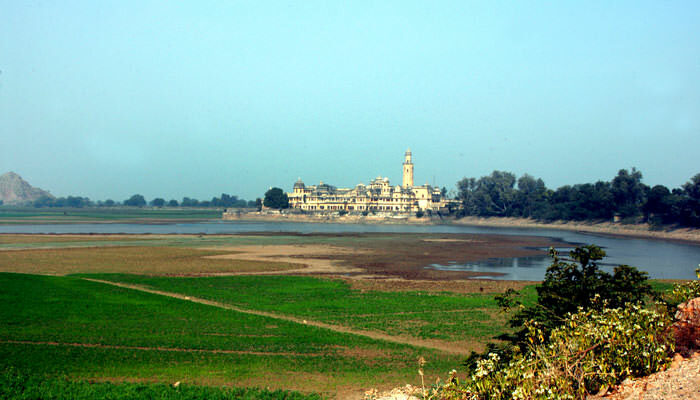 There is also a lake called as Vijay Sagar Lake located just adjacent to the lake. Vijay Mandir Palace showcases the royal life of the kings of Rajasthan at that time. Within the palace complex is a beautiful Sita Ram temple, generally crowded with devotees and visitors alike. The ground floor if the palace has been converted into govt. offices and district courts, the upper storey is presently a museum. One needs prior permission from the Secretary to visit the palace.